A system is an assemblage of parts, working together, forming a functional whole. Many types of environmental systems exist. From cells, to people, to cars, to economies to the whole planet. Systems occur on different scales. The systems approach is central to the course and has been employed for a number of reasons. The very nature of environmental issues demands a holistic treatment. In reality, an environmental system functions as a whole and the traditional reductionist approach of science inevitably tends to overlook or, at least, understate this important quality. 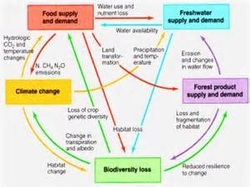 Furthermore, the systems approach is common to many disciplines (for example, economics, geography, politics, ecology). It emphasizes the similarities between the ways in which matter, energy and information flow (not only in biological systems but in, for example, transport and communication systems). This approach therefore integrates the perspectives of different disciplines. In this unit you will be introduced to the characteristics of environmental systems. Identifying some of the underlying principles that can be applied to living systems, from the level of the individual up to that of the whole biosphere. This unit will take a minimum of 2.5 hours. How does a systems approach facilitate a holistic approach to understanding? What are the strengths and weaknesses of the systems you have examined in this section? What have you learned about models and how they can be used, for example, to predict climate change? Do their benefits outweigh their limitations? During the 1970’s, British chemist James Lovelock and American biologist Lynn Margulis came up with the GAIA HYPOTHESIS: That the world acts like a single biological being made up of many individual and interconnected units (A SYSTEM ). There are different scales of systems. 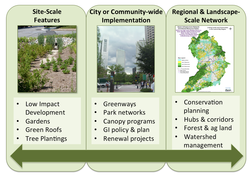 The range must include a small-scale local ecosystem, a large ecosystem such as a biome, and Gaia as an example of a global ecosystem. Forests contain many small-scale ecosystems. All living things use energy to do everything. 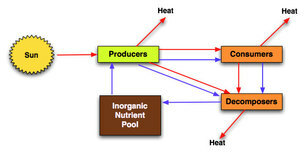 Ecologists trace the flow of energy through ecosystems to identify nutritional relationships. The ultimate source of energy for nearly all living things is the sun. Ecologists who trace energy and matter flow in ecosystems have identified a number of interesting things. Energy flows from one organism to another as each organism is eaten by the next. These relationships are called food chains. For example, a plant may capture the sun's energy then become food for a deer which may then be eaten by a bear. Each organism forms a link in the chain. 1.2.U5 The flows provide inputs and outputs of energy and matter. Energy flows from one compartment to another in the form of carbon–carbon bonds. When one organism eats another organism the energy that moves between them is in the form of stored chemical energy. 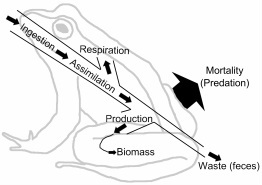 The flows are processes that may be either transfers (a change in location) or transformation (a change in the chemical nature, a change in state or a change in energy) Transfers normally flow through a system and involve a change in location. Transformations lead to an interaction within a system in the formation of a new end product, or involve a change of state. Using water as an example, run-off is a transfer process and evaporation is a transformation process. Dead organic matter entering a lake is an example of a transfer process; decomposition of this material is a transformation process. The size of the boxes and arrows in the systems diagram an be drawn to represent the magnitude of the storage or flow. 1.2.U8 An open system exchanges both energy and matter across its boundary while a closed system exchanges only energy across its boundary. Define and use the term closed system. Use examples of real systems to characterize an closed system. 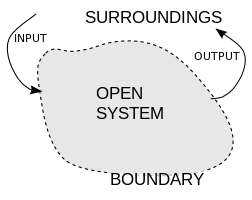 An open system is a system that regularly exchanges feedback with its external environment. Open systems are systems, of course, so inputs, processes, outputs, goals, assessment and evaluation, and learning are all important. Aspects that are critically important to open systems include the boundaries, external environment and equifinality. Healthy open systems continuously exchange feedback with their environments, analyze that feedback, adjust internal systems as needed to achieve the system’s goals, and then transmit necessary information back out to the environment. 1.2.U9 An isolated system is a hypothetical concept in which neither energy nor matter is exchanged across the boundary. A closed system in which there is no transfer of mass takes place across the boundaries of system but energy transfer is possible. Other than the universe itself, an isolated system does not exist in practice. However, a very well insulated and bounded system with negligible loss of heat is roughly an isolated system, especially when considered within a very short amount of time. 1.2.U10 Ecosystems are open systems; closed systems only exist experimentally, although the global geochemical cycles approximate to closed systems. 1.3.U11 A model is a simplified version of reality and can be used to understand how a system works and to predict how it will respond to change. A model is a simplified description designed to show the structure or workings of an object, system or concept. In practice, some models require approximation techniques to be used. For example, predictive models of climate change may give very different results. In contrast, an aquarium may be a relatively simple ecosystem but demonstrates many ecological concepts. Models summarize complex systems. Therefore they can lead to loss of information and oversimplification. A model involves some approximation and therefore losses accuracy. 1.2.U12 A model inevitably involves some approximation and therefore loss of accuracy. Evaluate the strengths and limitations of systems models. 1.2.A1 Evaluate the use of models as a tool in a given situation, for example, climate change predictions. ​Evaluate the strengths and limitations of climate change models. Below are 5 different climate model simulations. You should be able to discuss the strengths and weakness of each of these models. Which model do you believe is the best for understanding climate change? Justify your reasoning! Construct and analyze quantitative models involving flows and storages in a system. To make an ecosystem (diagram/ model) showing how an ecosystem works. It must contain at least three types of each of the following: abiotic elements, plants, herbivores, carnivores, and omnivores. Organism numbers must have the necessary resources in the ecosystem to maintain its carrying capacity. You are expected to be able to apply a systems approach to all of the topics in this course. You should be able to interpret system diagrams and use data to produce your own for a variety of examples. The use of models facilitates international collaboration in science by removing language barriers that may exist. Models are simplified constructions of reality-in the construction of a model, how can we know which aspects of the world to include and which to ignore? In this video Paul Andersen explains how matter and energy are conserved within the Earth's system. Matter is a closed system and Energy is open to the surroundings. In natural systems steady state is maintained through feedback loops but can be be affected by human society. Jane Poynter tells her story of living two years and 20 minutes in Biosphere 2 -- an experience that provoked her to explore how we might sustain life in the harshest of environments.